‘Who’s there?’ Cole shouted, glancing towards the door. He quickly selected the hibernate option and clicked on it. He waited for the computer to finish hibernating before he got up to his feet. He took off the earpiece in his ears and the mouthpiece attached to his collar and dropped them on the table. He then pulled on the head cover of his pull over jacket before he proceeded to the door and unlocked it. He walked back straight to his seat and sat, resting his hands on the table and placing his forehead on them. ‘What’s happening?’ Henry asked as he opened the door and stepped in. He looked around and noticed a female handbag on the chair facing the computer at the left corner. ‘Where is Tara?’ Henry asked, after looking around the place without seeing any other signs of Tarasha apart from the bag. ‘She’s gone out,’ Cole replied with a sigh and adjusted his head to send a message that Henry was disturbing his sleep. ‘Did she return at midnight?’ Henry probed further, not minding his unwelcoming response. ‘You can see her bag there, why are you asking again?’ Cole replied in a harsh tone and raised his head to give Henry a harsh look, trying to discourage him from asking further questions. ‘And she’s gone out again?’ Henry continued, refusing to be discouraged. ‘Yes,’ Cole answered him absentmindedly. Something was fishy, Henry thought. He had met Cole in the computer room when he returned the last night and was told Tarasha had gone out when he asked about her. He came out of his room some minutes before twelve am and still met Cole in the computer room, giving him the same report that Tarasha wasn’t back yet. He tried to stay for a while in the control room with Cole but he noticed that Cole was uncomfortable with his stay and suspected that Cole was hiding something from him. And even as he wasn’t so sure of what was been hidden, he was very sure Cole and Tarasha were up to something dangerous that could involve the life of someone and that was why he was not been involved. But he chose not to doubt them or bother about it, he decided to believe Cole wasn’t hiding anything from him. ‘By the way,’ Cole said on remembering something as he finally raised his head to look at Henry’s face. Henry stared at him silently for some seconds before locating a seat. He dragged it close to Cole and sat. ‘The Vice President has no children of his own,’ he said after clearing his throat. ‘Those three are not his children,’ Henry replied. ‘They went to the hospital for DNA tests and I saw the result of the tests, none of the three are his children,’ Henry replied. ‘I don’t think he has any, I think his recent illness led to the discovery that he has problems with his reproductive organ and he had to call the children from their different locations to come for the DNA test to confirm if he gave birth to them.’ Henry replied. ‘What the f***! Cole began to laugh. ‘Mehn… His wife played a really fast one on him, who knows if he’s a slowpoke in bed, that’s why the woman had to seek for help outside,’ Cole continued laughing out loud. Henry just stared at him, wondering how the situation was amusing him. ‘So, what are we really going to do with this information?’ Henry asked after Cole stopped laughing. ‘When is Tara returning?’ Henry asked after some minutes of silence. ‘Most likely late this night or midnight,’ Cole replied and put his head back on the table. Henry frowned. He was now very interested in what was happening. He wanted to ask more questions but stopped on seeing that Cole wasn’t ready to talk about it. He stood up quietly and proceeded out of the control room. Cole got up immediately he heard the door shut, he locked the door with the key and turned back to the system. He pushed the boot button and adjusted his seat to settle down. Tarasha peeped in and saw that there was no one in the lounge. She glanced back at the right time and saw the man hiding in the corridors just coming out with his gun raised. She quickly dashed into the lounge and hid behind the wall, sending a quick untargeted shot towards the man as he also sent his. She proceeded to the front entrance of the lounge immediately and got into the new passage. Her eyes went straight to the door of the room described to be the control room and she headed towards the place immediately. Just as she was a step close to the place, she heard the sound of the door opening and she quickly stopped beside the frame of the door. She took a quick glance back and then forth. A man stepped out of the place hurriedly and she charged towards him immediately, almost choking him as she grabbed his neck and pushed him to the wall. Another man rushed out immediately, with a gun in his hand but oblivious of what was happening outside the control room. He saw Tarasha holding his colleague to the wall just as he closed the door and turned. He tried to raise his gun but Tarasha kicked it off his hand before he could shoot. She dragged the man she was holding by the collar and pushed him towards the second man. Then she followed up with a kick to the belly of the man at the front. The man behind fell down first but the one who was kicked staggered for a moment until he was tripped by the foot of the man on the floor. She proceeded towards them and fired a bullet from the gun with the silencer into the forehead of the first man. She stepped back and dragged up the second officer, she made him raise his hands up in the air and pushed him towards the door. She pointed a gun at his back, ordering him to go to the door and open it. The door opened before they got there, another man had stepped out to check what the cause of the noise was. He wasn’t with a gun. He tried to rush back in immediately he saw Tarasha but she was faster was quick to send a bullet into his body making him fall against the slightly opened door into the room. She pushed the man in front of her faster into the room and hid at his back as she stepped over the dead man at the door. Three other men were seated in the control room and they had gotten up immediately they saw the man fall into the room. Only of them was able to locate his gun quick and fired a quick shot which scratched the ear of the man Tarasha was hiding behind. She responded quickly with a bullet to the unshielded man’s chest and dragged the man in front of her backwards. She had a hand tightened around his neck and a gun to the side of his head. The other two men standing behind the computers had already located their guns and were pointing it towards them. They were seated at opposite corners of the room with a distance of close to five metres between them. Tarasha was conscious of the opened door behind as she looked at the men’s faces and also looked around to see the positions of the chairs and tables in the room. None of the men said a word but held fast to their guns and pointed towards Tarasha. She cocked her gun again to warn them against making any moves as she began to step back slowly, not straight to the door but towards a table and chair by the left hand side. As she got exactly half a metre to the table, she pushed her hostage with great force in a straight direction towards the man sitting at her right hand corner and fired two shots to the man at the left corner as she went through behind the man she pushed to the back of the table. The man at the right corner was confused for a moment as he changed the direction of gun to find Tarasha but her body was hidden behind the pushed officer until she got to the table. Before he knew it, a bullet entered into his shoulder making him hit his back against the wall and before he could shoot with the gun which was at the other side, another bullet entered in through his neck. Tarasha got up from under the table immediately to see the man she pushed rushing to pick a gun but she shot in the direction of the gun which made the man dodge towards another direction. He stayed on one knee and raised his two hands in the air to show a surrender to Tarasha, still with his back turned to her. She walked to the door and locked it from behind and then proceeded towards the man. She pulled him up and faced her gun to his chest. ‘Which of the computer’s here is the main computer system?’ she asked. The man, in response pointed to the computer at the left corner. Tarasha raised her hand and took a quick glance at her wristwatch. She realized she didn’t have enough time to work on any computer. ‘I need to get to the first master room, what’s the fastest way to do that?’ she asked and began to look around the walls of the room. The man shook his head in negative, a sign to Tarasha that there was no faster way to get to the place. Tarasha adjusted her gun and placed it right at the middle of his chest. ‘Where’s the shortest way?’ she asked again. She was convinced that there would be one, there was no way the control room would not have a short link to the master secured bedroom in such a building like that. The man still shook his head but she was still unconvinced. Her eyes went up and immediately, she noticed a part of the ceiling which would allow for her to get into it, she knew it was exactly what she was asking for. The man’s eyes also went in the same direction and he knew from the look in her eyes that she already knew that was the route to the place. ‘How do I get to the master bedroom from there?’ Tarasha asked. He still shook his head. He wasn’t going to talk even though he knew she could kill him, he was committed to his job and willing to die to protect the secret. Tarasha smiled on realizing his loyalty to his job. Her eyes fell on his pocket of his uniform and she saw his name and title written boldly on the tip. The man was shaken by the threat. He knew she had seen his name where it was written but he also knew that if she was truly Samantha Osman likeshe claimed, she could really trace his family and kill them as she said. But if he kept the secret to himself, there was a possibility that her purpose for attacking would fail or she’d probably get to be arrested by the other officers. He almost made up his mind to keep his mouth shut when he remembered that she had never been caught by the police on any occasion, no matter the number of officers that tried or how tight the situation was. He wasn’t ready to sacrifice his family. He shook his head as he gave a sigh. ‘The remote control is over there,’ he said pointing to a white device located on the next table. ‘The red button opens this part and the green opens the master room,’ he added. Tarasha moved carefully to the place, with her gun still pointed at him. She picked the remote and found several buttons of different colors, she located the red and the green. She pointed it towards the part of the ceiling and pressed the red, a small hole opened slowly, enough for anybody to conveniently pass through. ‘How do I find my way there?’ she asked the man. ‘Follow the green track,’ he replied. She stared at him thinly for a moment, wondering whether to leave him alive and just make him unconscious or kill him. She almost put her gun down but raised it again as she remembered something. She sent a bullet straight into his chest. 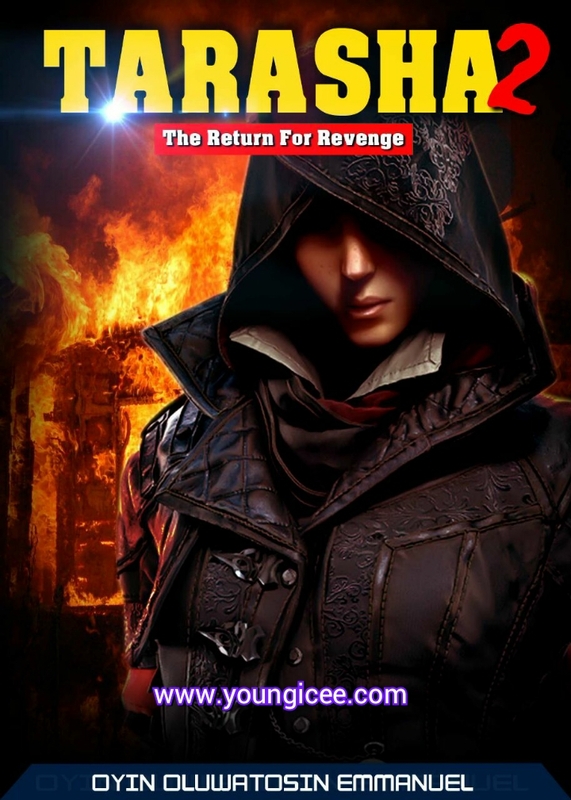 She was an assassin and assassins had no time to show mercy or reward people for helping them. As she dragged a table to fix under the opened part of the ceiling, she began to hear sounds outside the room of people trying to open the door. Chief Rikau was now awake in his room. He sat uncomfortably in a seat close to the bed and was sweating even with the air conditioner. Seven officers including Agent Tim were in the room with him but he could not still put his mind at rest. He had a feeling that the attacker could be Samantha Osman and didn’t think he would be able to escape death in her hands this time around. ‘Nine,’ the voice on the other side of the call replied. ‘A lady and a radio?’ Agent Tim asked. ‘A lady?’ the inspector general shouted in fear from behind. Agent Tim turned to look at him and nodded in affirmation. ‘Bring the phone to me,’ he ordered and Agent Tim obeyed immediately. A longer episode should be posted on Wednesday. Hope she will succeed without any harm. Tanks for the interesting story… Noticed something recently pls why can’t save website and email in this site anymore, person need to dey comment for story nt to be a “Ghost Reader” You know. Last time upload was just flat. No conflict. will tarasha finish the IG this time???? Hmm, a solo mission by Tara, I believe she has prepared for this mission, so getting hurt isnt an option. I still believe that d cabal or d head behind all this is that chief, The one that Patricia is currently working with. I dey enjoy you bro, you really tried with this. Oyin kudos to you but is short,make it more interesting and longer by Wednesday. waiting patiently. Am coming to comment later. Tanks for grante my request God Grace nd blessing always be with you IJN Amen Oyin Prince Emmy. Guys you can now comment. The ban has been lifted. Alright, weldon Oyin… I am still trailing from behind. Ve been a ghost reader, must say its been a bomb frm d begining. Oyinprince, keep d flame up, more greece 2 ur fingers. Am suspecting this Henry, he’s up to something. He maybe plotting on how to hand Tara over to the police if Tara embark on killing spree. “To be continued on Wednesday.